I was talking recently about Spirit Map with Kate Tucker, a retired minister and spiritual director here in the Minneapolis/St. Paul area. 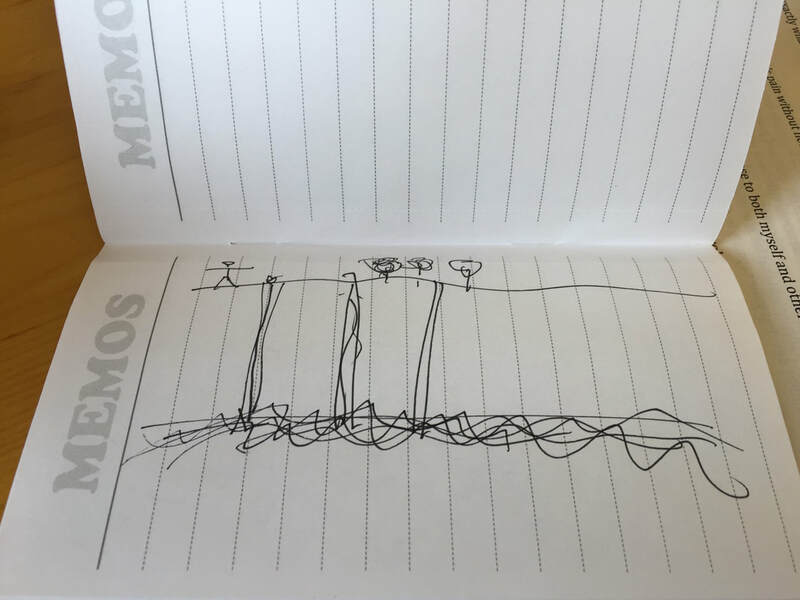 She drew the rough sketch above about how she saw Spirit Map working in people’s lives. I just loved her metaphor and so I begged her to let me share it, even though it wasn’t as polished as she might have wanted it. Kate described the spiritual life as a deep wellspring, represented by the horizontal flowing lines. Way up above, where the trees are, a person (the stick figure) lives their life. Spirit Map, Kate said, offers a tap into the wellspring of spirit, offers a clear description of many aspects of that spiritual life, creating channels for the water to flow up and hydrate. There is still mystery, still the unpredictable spiritual journey, but Spirit Map gives language to engage with that mystery and that journey more intentionally. What taps into the wellspring of the spiritual life could Spirit Map offer you? Take the Spirit Map inventory yourself and see! You can purchase a Spirit Map report, which gives you full access to the inventory, or you can try a sample inventory. Or, explore our website to learn more about us. 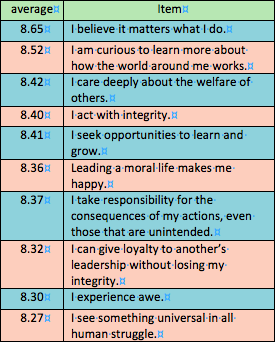 What items show up most often as Signature Strengths and Key Opportunities for the individuals who have completed Spirit Map? We analyzed 523 responses from people who completed Spirit Map for their congregation* to see. I seek opportunities to learn and grow. I believe it matters what I do. I am curious to learn more about how the world around me works. I care deeply about the welfare of others. I take responsibility for the consequences of my actions, even those that are unintended. Leading a moral life makes me happy. I act in an authentic manner. I believe my life has meaning and purpose. I make good decisions about when to act. I have a clear purpose to my life and am able to articulate that purpose to both myself and others. I give to others fully and generously. I can be in the presence of my own or another’s pain without needing to flee or fix it. I have the ability to repent, forgive myself, and change. I’m able to adapt when things do not turn out the way I want. I can ask for and accept forgiveness. I actively practice my spiritual or religious faith. I act in a spiritual manner. I can tell the difference between what I am responsible for, and what I do not control. SS: I believe my life has meaning and purpose. KO: I have a clear purpose to my life and am able to articulate that purpose to both myself and others. SS: I care deeply about the welfare of others. KO: I give to others fully and generously. We regularly see these pairs emerge for the individuals and congregations who complete Spirit Map, and we encourage them to consider how the Signature Strength might support work on the Key Opportunity. For example, in the first pair, the belief that life has meaning and purpose can provide both motivation and a frame for the search for vocation. Daily reflection on what meaning has been found in that day (and where it was not found) can suggest possibilities for a meaningful vocation that connects to a higher purpose. Daily reflection on the meaning found in that day can also strengthen the ability to shift vocation as circumstances change, so that it does not become a static vocation that over time loses its ability to be a vehicle of service to the world’s need or an all-consuming idol out of balance and right relationship. In the second pair, the opportunity is to translate deep caring into personal generosity. Daily reflection on where the care for others might find concrete and generous expression, within good boundaries so that neither the giver nor the recipient becomes burdened, can help both individuals and congregations find the redemptive power of love acting in the world. Do many of the most-frequent Signature Strengths come from the Communal domain because people who join a congregation have already developed those strengths? What does this mean for the congregation’s ministry to people who are not already strong in this area of their spiritual life, but still have a deep need for community? How might it change the church’s ministries to know that people often identify the personal and spiritual domains of their spiritual well-being as particularly needing attention? What are the most-frequent Signature Strengths and Key Opportunities in your congregation? Contact us to start the Spirit Map process in your congregation and find out. What are your personal Signature Strengths and Key Opportunities? Take the Spirit Map inventory yourself and see! You can purchase a Spirit Map report, which gives you full access to the inventory, or you can try a sample inventory. Or, explore our website to learn more about us. *We used the data from three Unitarian Universalist congregations, one in Minnesota (n=248), one in Colorado (n=302), and one in Massachusetts (n=133). We only used the data from people in these congregations who gave a self-assessment and an importance rating to all 44 Spirit Map items, hence the n for this analysis (523) is less than the total sample from the three congregations. Do the people who identify as men and women respond differently to the Spirit Map items? Of the 768 people who have completed Spirit Map*, 466 identified as female and 220 identified as male. Nine people responded with a different gender identity, which does not give us enough data to say anything definitive about their responses. The rest did not respond. 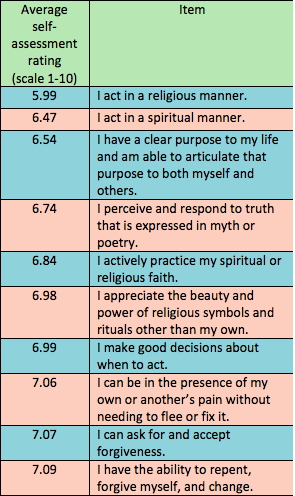 Women give higher ratings than men, in both their self-assessment and importance ratings of the Spirit Map items. Even though women tend to rate the items higher, women and men tend to have the same take on what’s more and less true of them and on what’s more and less important to them. I appreciate the beauty and power of religious symbols and rituals other than my own. My spiritual growth is important to me. I see something universal in all human struggle. I perceive and respond to truth that is expressed in myth or poetry. I am mindful of my emotions. I delight in experiences both great and small. I feel part of something larger than myself. 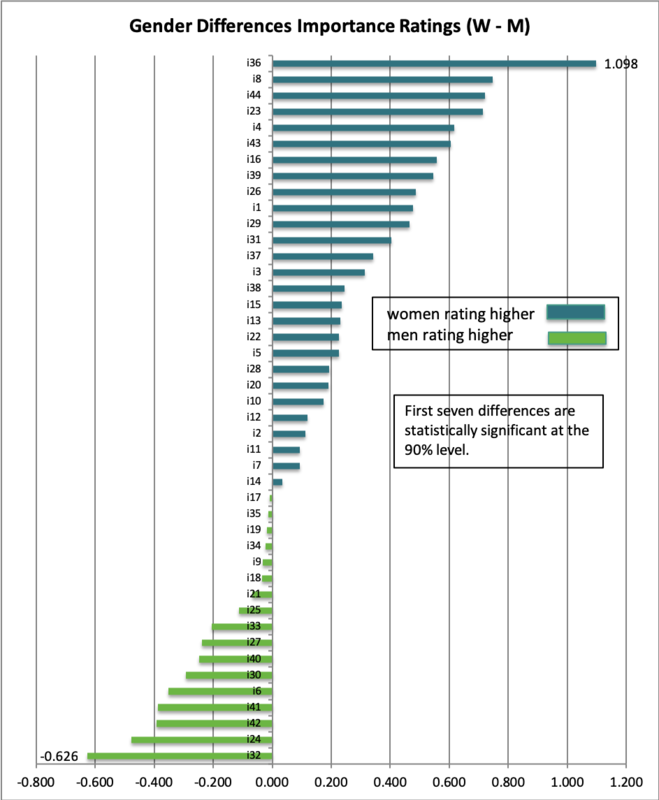 We can see how men and women have a similar take on what's more and less true of them and what's more and less important to them by plotting each item according to women's average rating and men's average rating. 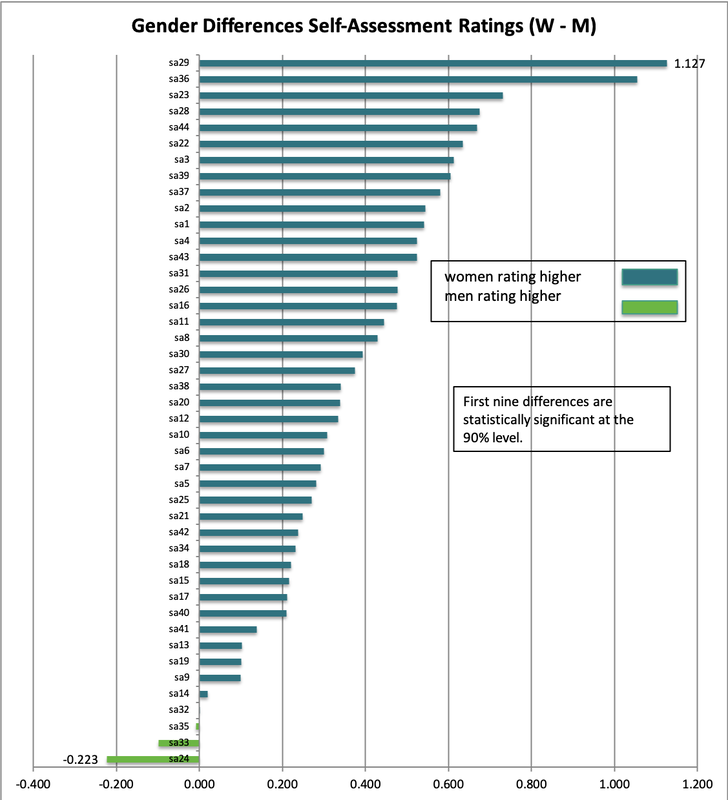 As you can see from the graphs below, the correlation (R) between men's ratings and women's ratings is very high, which means that women and men tend to rate the same items relatively higher and lower. ​What's most true of you and most important to you in your spiritual life? Take the Spirit Map inventory yourself and see! You can purchase a Spirit Map report, which gives you full access to the inventory, or you can try a sample inventory. Or, explore our website to learn more about us. *We have four sources for this data. Three data sets come from three Unitarian Universalist congregations, one in Minnesota (n=248), one in Colorado (n=302), and one in Massachusetts (n=133). The third data source is from individuals who have independently taken the Spirit Map survey (n=85). What's Least True of Us and Least Important to Us? ​One pattern worth noting is how many items on both lists relate to living the spiritual or religious life. Acting in a spiritual or religious manner is less true of and less important in the spiritual lives of the people who have taken Spirit Map so far, despite the fact that most of them belong to a religious community. Their sense that acting in a spiritual or religious manner is less true of them and less important to them seems consistent with the trend that an ever-increasing number of Americans say they have no religious affiliation (currently 22.8% of the US population, according to Pew Research). If you’re a congregational leader, this could represent an opportunity to reclaim the meaning of the spiritual and religious life by explicitly connecting spiritual and religious practice to what people identify as most true of them (see this post) and most important to them (see this post). This could help renew faith practice by connecting it to what people find particularly relevant for them today. What does it mean for people of faith to act with integrity? What can we learn from spiritual and religious teachers about what it means to act with integrity? What spiritual and religious practices help people act with integrity? 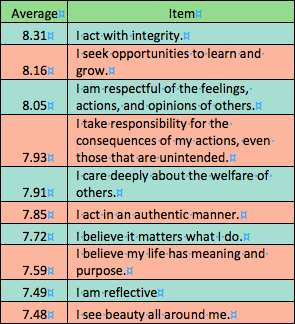 If you’ve done Spirit Map in your congregation and found this same pattern, you might also want to invite people to explore why they rated those items lower and see what additional insights you can gain from their reflections. What other patterns are you seeing in these lists? What other opportunities do these items present? Leave your reflections in the comments! Take a moment to become centered and calm. Perhaps settle into the surface you are sitting on and notice and feel the support it provides you. Now contemplate the phrase, "I act in a religious manner" and see what rises. Without judgement, notice what happens in your body and mind as you sit with this phrase. Simply observe. You may want to journal in a stream of consciousness way about what comes up for you. What do you notice? Are there negative associations? Are there well worn stories that arise? When this exercise feels complete or you have opened some insight for yourself, return to a centered and calm space, again noticing the support of the surface you are sitting on. Now repeat the exercise with this phrase, "I experience faithful devotion to an ultimate reality". Again, without judgement, notice what happens as you slowly sit with this phrase. What happens in your body and your mind? When this feels complete, come back to calm and sit with the phrase, "I am scrupulously and conscientiously faithful". Again notice. When you have sat with and witnessed all three phrases, wonder a little about the reactions that came up for you. Did replacing "religious" with dictionary definitions shift focus for you? Out of these 3 phases, is there one that feels more important and true for you? Why? Where do you find the intersection of what’s true of you and what’s important to you in your spiritual life? Take the Spirit Map inventory yourself and see! You can purchase a Spirit Map report, which gives you full access to the inventory, or you can try a sample inventory. Or, explore our website to learn more about us. *It’s important to note that we ask people to rate the relative importance of the Spirit Map items, which means that when someone says an item is relatively less important it does not mean that item is necessarily unimportant to them. **We have four sources for the data that make up these averages. Three data sets come from three Unitarian Universalist congregations, one in Minnesota (n=248), one in Colorado (n=302), and one in Massachusetts (n=133). The fourth data source is from individuals who have independently taken the Spirit Map survey (n=85). What's Most Important to Us? Every person who completes the Spirit Map inventory rates the 44 Spirit Map items two ways, using a scale of 1 to 10. 1. How true is this statement of you today? 2. How important is this statement in your spiritual life? We have four sources for the data that make up these averages. Three data sets come from three Unitarian Universalist congregations, one in Minnesota (n=248), one in Colorado (n=302), and one in Massachusetts (n=133). The third data source is from individuals who have independently taken the Spirit Map survey (n=85). Even though this is obviously not a random sample, what could we learn about the people who have taken Spirit Map so far and what they identify as important in their spiritual lives? Many of these are the same items that are most true of us (see this post), which indicates a certain alignment in our spiritual lives between what we see as true of us and what we feel is important to us. Future posts will explore the meaning and implications of this alignment, the strengths and opportunities of that alignment. We can also look at these items in terms of how they group into various dimensions of spiritual well-being. We applied a statistical procedure called factor analysis to them, which bundles together the items that define a common underlying dimension or factor within the overall domain of spiritual well-being. 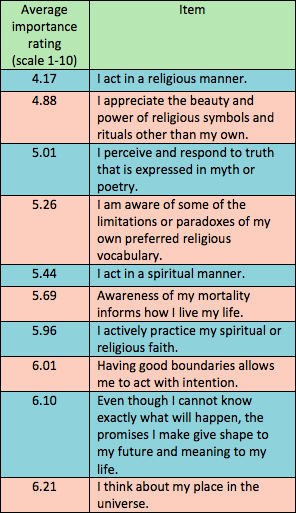 Download our white paper for more information on how the 44 Spirit Map items cover the domain of spiritual well-being, and how the factor analysis assigned the 44 items to spiritual well-being dimensions. I am respectful of the feelings, actions, and opinions of others. It’s also interesting to note that, as with the most-true items, none of the most-important items comes from the Spiritual dimension of our Spirit Map items, the items that speak to our spiritual or religious practice. What might it mean for people to be more broadly connected to the vulnerability and humility one finds in the experience of the holy? Could a broader connection to mystery and wonder, to that which is larger than ourselves, more fully ground people for the Communal dimension we already see as important? When you look at this list of what is most important, which one do you most deeply resonate with? Recall a time in your life where it was clear to you why this statement feels resonant and significant to you. How has that event affected your life and how you act in the world? Share this story with someone you love. What is it like to flesh out this statement of what is most important to you? What's most important to you? Take the Spirit Map inventory yourself and see! You can purchase a Spirit Map report, which gives you full access to the inventory, or you can try a sample inventory. Or, explore our website further to learn more about us. What is most true of us? What might we learn from what's true of us collectively? First, it’s worth considering whose data makes up these averages. We have four sources. Three data sets come from three Unitarian Universalist congregations, one in Minnesota (n=248), one in Colorado (n=302), and one in Massachusetts (n=133). The third data source is from individuals who have independently taken the Spirit Map survey (n=85). I can give loyalty to another’s leadership without losing my integrity. Only one of the top ten most-true statements speaks to the religious experience itself: I experience awe. What might it mean for people to be more broadly connected to the vulnerability and humility one finds in the experience of the holy? Could a broader connection to mystery and wonder, to that which is larger than ourselves, more fully ground people for the action that expresses their spiritual values, action the people who’ve taken Spirit Map already see as true of them? I have had the pleasure to work with many people who have taken Spirit Map and recognized in the results something that rang very true for them. I have also had the honor to lead them deeper into what the results mean for them and how they play out concretely in their lives. This is the real power of the inventory. The universal statements of Spirit Map capture a high level view of strengths and opportunities which come into their most beautiful expression in the details of a lived experience. Within our lived experience, we can gain awareness that enables us to live even more deeply into our strengths and to explore and lean into our opportunities. What did it feel like to live into this aspect of life? What gifts did you receive from this scenario? What gifts did others or the world receive from this scenario? What's most true of you? Take the Spirit Map inventory yourself and see! You can purchase a Spirit Map report, which gives you full access to the inventory, or you can try a sample inventory. Or, explore our website to learn more about us.